The other night I was changing the bandages of Nicky’s lower back and to my dismay, in the attempt of healing the area, the opposite happened. It’s now worse than it’s ever been. The whole area is a BIG open wound. Ugh. It’s always a shock to me that I can even do this. Before Nicky was born I was an absolute wimp, who could not watch my own blood being drawn. Amazing what we learn to do out of love for our children. WIth his lower back now a bloody wound, my heart sank. Because of that, I resolved to make sure to use my concoction on it as well-I haven’t because this is an area very difficult to bandage and using the cream makes the bandage slip around quite a bit and Nicky hates that. It’s one thing to use the cream on areas where we can bandage well, such as arms and legs, feet etc, but the back it’s another story. It requires me bandaging around his stomach below the g-tube and while Nicky is adamant about being bandaged in many areas, the stomach he refuses to. But now he has no choice. And I hate that I have to put him through that. He goes through enough. Every day since he was born I have had to evaluate the way I can help him without hurting him too much. I have had to balance the risks and benefits of everything I do to him. I have tried to make him part of every decision as early in his life as possible, giving him as much information as I could for whatever age he was in. As new clinical trials have become available once he was a teenager, I felt it was important to question the usefulness of each treatment. Sometimes the treatment causes horrible suffering and offers only a brief or limited relief. And that’s IF they work. It’s extremely important to distinguish between a genuinely useful treatment and one that cruelly creates the illusion of hope. So, Nicky has been in charge of making the final decision since then, when he was 13, when he decided against the BMT after a trip to Minnesota. Actually, truth be told, it was way before then. My last official decision of doing any kind of surgery to him, was when he was 4. He was the one that wanted surgery on his hand when he was 6, and he would tell me when he wanted his throat dilated. It’s his body after all. He was the one that wanted to do the skin graft gene therapy trial and the cream trial at Stanford and the one that refused to do the Gentamicin at USC. I give him the information and I let him make the decision. This has nothing to do with him not being brave enough to do certain trials or not, it’s him making decisions about his life only HE can make. It was his decision, in fact, for me to post the following two pictures of his foot. He got these when “transferring” from his chair to the couch. Blood blisters like these are extremely painful to poke and take months to heal. With the cream, however, they are almost healed a little over a month later. His feet are heavily wrapped to prevent any blisters at all, but sometimes the pressure is just too much. At a little over 100lb, it’s much harder to walk for him than when he was younger and lighter. His feet were also stronger then, they are much more fragile now. It’s the nature of the beast. Once an area gets wounded, it’s much easier to wound again, the more it gets wounded, the more fragile it becomes. This is why some areas of his body, which have been wrapped since he was an infant, are so strong now, it’s because they never got wounded in the first place. 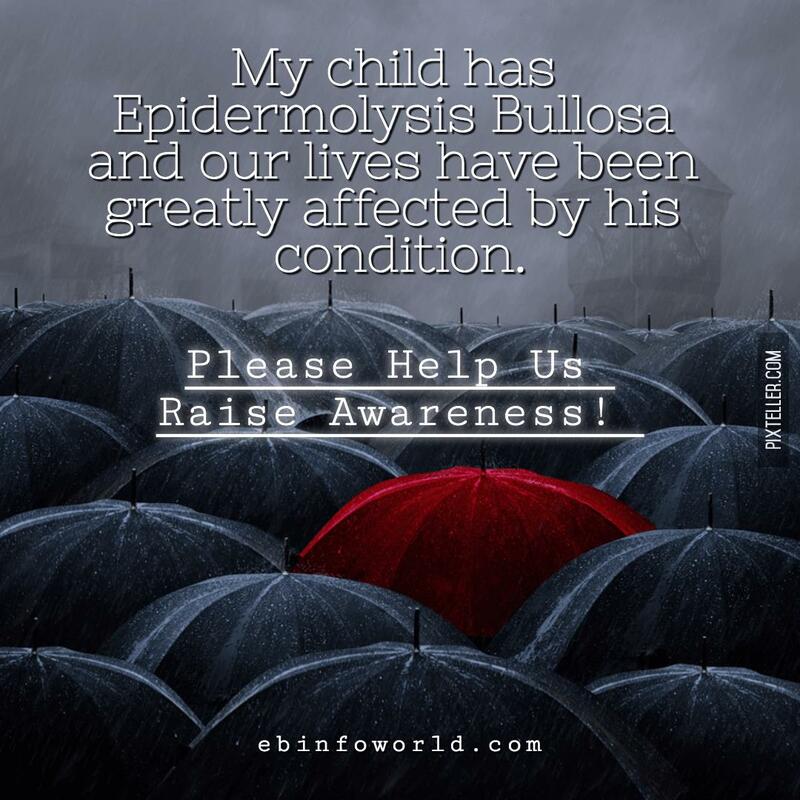 Make no mistake, Nicky wants people to know about EB, he wants EB awareness, this is why he insists on me taking photos and to let everyone know what he goes through. Only through awareness we can ever hope for a cure.